Here's a way to learn a little bit about a person's viewing history and habits: ask them what the target audience of cinematic fairy tales is. If they don't even pause before suggesting that it's children then there's a good chance they've never seen Jean Cocteau's 1946 adaptation of La Belle et la Bête, or Beauty and the Beast as the English translation has it. If this includes you then you can safely skip this review and just go get this disc, as this is one of those movies that every film fan, certainly every fantasy film fan, owes it to themselves to see. And you won't need that excuse of sitting down with the kids to justifying watching it. Believe me, if they're on the sofa with you then they're just along for the ride. This is, as many have pointed out before me, a fairy tale for adults. That doesn't mean it's too dark and violent for kids – trace most fairy tales back to their roots and that's exactly what they are, but this is not the case with La Belle et la Bête. Kids may well enjoy the fantasy, but the artistic texturing, the blend of naturalism with surrealism and the social subtext are designed specifically for adult appreciation. And oh, there's so much here to enjoy. The problem, of course, with talking about a film as widely celebrated as this one is that whatever I write about it I can be pretty sure that someone else has probably already beaten me to it. I'm not going to go up against these heavyweights, a good few of whom have studied Cocteau's career in detail and have seen this film and the works it has influenced many more times than I have. But I'm happy to second their passion, and to add my own few words of encouragement to those who have yet to experience its delights to seek it out and see just why we all get so worked up by it. 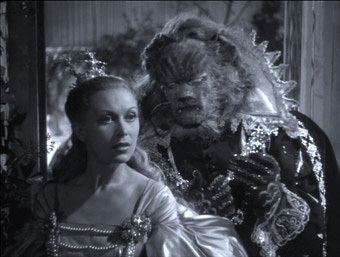 La Belle et la Bête is adapted from the version of the story written in 1956 by Madame Jeanne-Marie Leprince de Beaumont, which Cocteau builds on in a way that textures rather than clutters the narrative. The Belle in question keeps house for her financially strapped father, her good natured but idle brother Ludovic, and two conceited and verbally abusive sisters straight out of Cinderella. So devoted to taking care of her father is she that she feels unable to accept the proposal of handsome suitor Adélaïde. Given that he's a close friend of Ludovic and every bit as directionless, this might not be a bad thing. Anyway, one night her father is travelling home through the forest when he gets lost in fog and finds himself in the grounds of an enchanted castle. Having eaten and rested, he keeps a promise to Belle and picks a rose from the grounds and is immediately challenged by the castle's monstrous-looking owner. The Beast is merciless – for stealing one of his precious roses the father is instantly sentenced to death, unless he can persuade one of his daughters to return in three days and die in his place. To buy himself some time with the family, dad chooses the latter option, but when Belle is blamed by her sisters for landing their father in this predicament, she sneaks out and rides the horse supplied by the Beast to his castle. Rather than kill her, he compels her to stay, lavishes her with jewels and visits her every evening to ask if she will marry him, an offer she repeatedly declines. With the passing of time she comes to appreciate the Beast's tender side and grows fond of him, but when he allows her to visit her father, she is unprepared for the greed and self-interest of her siblings. The film digs its claws into you in three arresting and distinctively different stages. The first involves the opening titles, a lively and playful sequence in which cast names are chalked on a blackboard, the spelling of the title is corrected by the adding of a circumflex to 'Bête', a clapperboard reminds us that that we're watching a movie, and Cocteau invites the adult audience to view the story with the innocence and faith of children (in the accompanying commentary, Christopher Frayling suggests this was aimed directly at a hostile French critical fraternity). The drama begins and we're hardly given pause for breath. The characters are introduced and story set up at lightning speed, with imagery influenced by Vermeer and Renoir, precision editing and comic timing (the sisters' argumentative departure at the hands of drunken palanquin operators is a riot) all coming together in a virtual celebration of the art of film storytelling. But it's stage three that exerts the real pull, the one that that still startles and captivates over 50 years on. From the moment Belle's father enters the Enchanted Castle you know full well that you're watching something unique, a particular visual magic that no other filmmaker has captured so effectively. 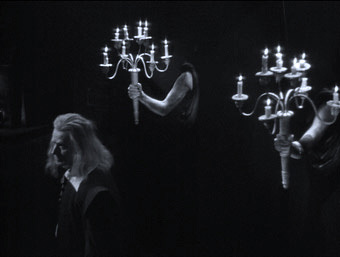 Rejecting special effects in favour of what Frayling nicely describes as "physical surrealism," Cocteau creates a castle interior straight out of the dreams of children, with self-lighting candelabras held by human arms that grow out of the wall, a fireplace framed by animated human faces that blow smoke and turn to watch the movements of those who pass, and a dining table that serves food and drink to its startled guest. When Belle arrives, entering in gorgeously shot slow motion and then gliding down a corridor as if pulled along by some unseen force, the range of wonders widens to include a mirror that reflects the user's fears and desires, a pearl necklace that rots when handed to someone less deserving, and a glove that can transport its wearer instantaneously to a location of their choosing. The meat of the story is in the subtext, of course, in the notion of loving someone for who they are rather than who they appear to be, of men of genial outward appearance who are "hairy on the inside." 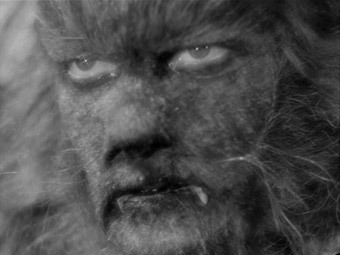 The Beast himself, a princely dressed, rasp-voiced cross between Lon Chaney's Wolf Man and the Cowardly Lion from The Wizard of Oz, is representative of man as both a savage primitive and a sensitive and devoted romantic. "My heart is gentle, but I am a monster," he almost shamefully admits to Belle, to which she knowingly responds, "Many men are more monstrous but they disguise it." It's not too long before the good-looking Ludovic and Adélaïde arrive at the castle to prove her right. La Belle et la Bête is a film whose every scene and shot is ripe for analysis and enthusiastic discussion, and you won't have to look far to find a detailed and learned essay on the film's style and underlying themes – there are two included in the booklet that accompanies this DVD. By all means enjoy the film for its subtext, but do so also for its boundless energy and tender humanity, for its poetry and its eye-popping "physical surrealism," for Cocteau's seemingly effortless melding of the mainstream with the avant-garde, for its characters and its storytelling, for Henri Alekan gorgeous monochrome cinematography and Claude Ibéria's editing, for Christian Bérard and Lucien Carré's richly layered production design and Georges Auric's music score. And perhaps most of all, for reminding us how wondrous and magical the world can appear when seen through the eyes of children. La Belle et la Bête was previously released on DVD by the BFI back in 2001. Although the contrast and detail were very good, the age of the film really showed in the plethora of dust and occasional damage present on the source print. This new transfer is the result of a high definition restoration by Fullimage for Studio Canal with the support of Sky Arts, and the film has been transformed. The dust and damage are all gone, the image has been stabilised, and save for some brief but faint vertical light strips on a couple of the darkest scenes, this is a lovely transfer, boasting all of the strengths of the original release but stripped of the defects. Even if you have the original release, this picture improvement is worth the upgrade. The 320kbps PCM soundtrack inevitably betrays the film's age through the limited dynamic range and slight distortion of music, but is otherwise clean and as clear without a trace of damage and almost no background hiss. Here the new version loses out a little to the original release, retaining only one of its on-disc extras in the shape of the Christopher Frayling commentary. If you don't own the original release and are looking for a second reason to purchase this one then this is it. Frayling, as ever, proves a knowledgeable guide to the film's qualities, covering the various readings of particular aspects, the changes made by Cocteau to Madame Leprince de Beaumont's original, and more than once refers to Cocteau's own diary of the making of the film. He also touches on the 1991 Disney animation, and in one of my favourite moments remarks that this version of the story featured "a testosterone driven beast who in the last reel turns into a Chippendale." New to this edition is a Masters of Cinema-standard booklet featuring detailed essays on the film by Marina Warner and George Turner, extracts from Cocteau's film diary, biographies of Jean Cocteau and lead players Jean Marais and Josette Day, stills, credits and a reproduction of the original poster. The original release may have had more on-disc extras, but the restoration job done on the picture is enough to justify the upgrade for fans and should make this an essential purchase for just about everyone else. A wonderful film looking better than I've ever seen it. Highly recommended.